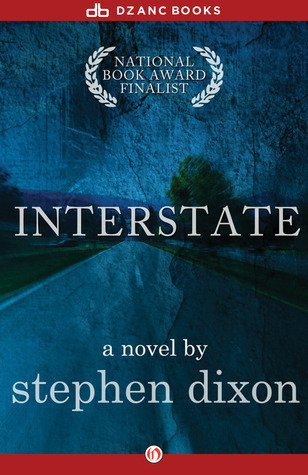 Stephen Dixon’s “Interstate” takes eight different passes at the same story, and each of them is remarkable in its own vision. Imagine you’re a father, driving home with your two young daughters after a long weekend in New York City. Somewhere on a desolate stretch of Interstate, a car pulls alongside you, and the passenger and driver seem intent on scaring you. They force you over to the rightmost lane. The passenger pulls out a gun and waves it at you. You yell to the backseat for your girls to get on the floor. The other car pulls ahead. Then the passenger fires. You stop and find your younger daughter has been wounded. Critically. How do you deal with this? How do you cope with the horrifying pain that’s to come? And what if one tiny thing changed during the lead-up to that event? “Interstate” is eight different vignettes relating to this story. Each captures a moment on the timeline on this horrible day. Nathan and Lee are married, with two lovely daughters, Margo and Julie. The family has spent three days at Lee’s parents’ NYC apartment, and Nathan has to drive the girls home for school; Lee wants to stay a couple more days. On the ride home, the tragic shooting occurs. We catch Nathan and Margo at different points on the timeline in relation to the crime, from a stream-of-consciousness real-time account, to events leading up to the event, to the horrific immediate aftermath—the i-dotting and t-crossing, if you will. Other chapters show what might have happened if the proverbial butterfly had flapped its wings another way, and the shooting were avoided. Would life continue happily? Questions arise as to just how happy the family’s life is anyway. Nate not only has a temper, but a profoundly disjoined way of speaking, prone to digression and circumlocution. During the stream-of-consciousness chapters, we see that his mind goes a zillion miles a second, too. “Interstate” is a difficult book to describe and review. This is perhaps easiest: imagine an asterisk. The center of the asterisk is the specific time and location the tragedy occurs. Each of eight lines radiating from the center represents a different slice of life, or a a different possibility relating to the tragedy. The novel, “Interstate,” collects these eight lines. Some have different tragic results. Some manage to skirt danger. The beauty of “Interstate” lies in how author Stephen Dixon takes us through each unique—yet inexorably connected—story. All of them are possibilities. All of them contain the same characters, frozen in different times and situations, all leading either toward or away from that crucial point. Which story is truest—the one that “really happened”? They all are, and none of them are. “Interstate” shows how the smallest change—Julie having to run back upstairs for her forgotten stuffed bear, hypothetically—could result in an enormously different outcome. “Interstate” happens mostly through Nate’s eyes. One of Mr. Dixon’s greatest achievements here is showing this same troubled mind during normal times, under stress, and when dealing with the unthinkable. This book is not for everyone. In aggregate, the narrative is non-linear–we go from D to E to B to F to A, e.g.—and some readers may find Nate’s thought-stream a bit difficult to navigate. For those who make it through the turbulence, though, “Interstate” will reward. Either way, it is one hell of a ride, unlike anything else I’ve read this year. This entry was posted in Books, Literary or Genre Fiction. Bookmark the permalink.